Censorship profoundly affected early modern writing. 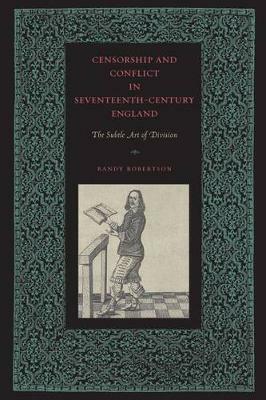 Censorship and Conflict in Seventeenth-Century England offers a detailed picture of early modern censorship and investigates the pressures that censorship exerted on seventeenth-century authors, printers, and publishers. In the 1600s, Britain witnessed a civil war, the judicial execution of a king, the restoration of his son, and an unremitting struggle among crown, parliament, and people for sovereignty and the right to define "liberty and property." This battle, sometimes subtle, sometimes bloody, entailed a struggle for the control of language and representation. Robertson offers a richly detailed study of this "censorship contest" and of the craft that writers employed to outflank the licensers. He argues that for most parties, victory, not diplomacy or consensus, was the ultimate goal. This book differs from most recent works in analyzing both the mechanics of early modern censorship and the poetics that the licensing system produced--the forms and pressures of self-censorship. Among the issues that Robertson addresses in this book are the workings of the licensing machinery, the designs of art and obliquity under a regime of censorship, and the involutions of authorship attendant on anonymity. "Robertson's work is a welcome contribution to a field already warmly contested, and the 'British Index' online will surely prove invaluable, enabling new questions to be asked as well as old ones answered." "This book is a welcome entry in an expanding scholarly conversation, and Robertson's wide-angle view makes his contribution quite attractive."